With the slogan “One day can change your whole life,” we celebrate Global Wellness Day on the second Saturday of June every year as an international day. All of us would like be healthier, to look better, and to live well both physically and spiritually. Living well is almost the entire world’s shared dream. The purpose of Global Wellness Day is to ask the question, even if for just one day, “How can I live a healthier and better life?”, to direct the thoughts of both individuals and society towards “living well” and to raise awareness. After the overwhelming response we had in 2017, with the positive impact made in people's lives in areas of physical, spiritual and social well-being, we cannot wait to do this again! In 2018, we continue to bring you a day of wellness for the mind, body and soul. Join us on 9 June 2018 from 8.30-1730 for a day of programmes that are suitable for adults and children. Global Wellness Day 2018 Speaker Trained by Schouten University China/The Coaches Training Institute, coaching combines Eike's passion: interaction with people, exploring new worlds, adventures and personal development. Alongside coaching, she likes to take people on bike tours through the Hutongs discovering Beijing with Wan Lin Bicycle Tours. She also runs the Growthbeans Beijing Chapter. Global Wellness Day 2018 Speaker Nathalie has lived on five continents over the last 23 years and in more than 13 countries. The incredible journey and constant change led her to ask herself many questions about the meaning of life: How to be in harmony with ourselves when we lose our bearings? How to cope with this feeling of being uprooted? How to face this feeling of physical and mind dispersion? Searching for answers outside of herself, she finally realized that everything she needed was there, deeply anchored inside her. Certified in coaching from the University of New York and later in Mindfulness/Sophrology from the Franco-Swiss Academy of Sophrology, she wants to share her experience and help others. Global Wellness Day 2018 Speaker ​Lan has been working as an administrator for many years until she accidentally stumbled upon art. She did not know she had a gift until one day she found out her drawing ability by accident. It is a present given by God. The drawing experience gives her inner joy and peace. Global Wellness Day 2018 Speaker Swannie's passion for hoop dancing led to the launch of Hoop Heroines. brings the technical aspect of hoopdancing. Each of them also bring 10 years of experience in either modern-jazz and classical to give a multi-faceted approach. Global Wellness Day 2018 Speaker Andreia started her path through spiritual development 13 years ago, knowing that one day she would work to make the world a better place. Her journey wasn't easy, from an eating disorder to a tremendous lack of self love and respect. She studied Yoga in New Zealand, and left her corporate job as an architect to become a Yoga teacher in Beijing. She eventually found her calling to change the world one woman at a time through "Flowing into Femininity". Global Wellness Day 2018 Speaker Combining a full-time job or full-time studies with exciting side projects has always been Helena’s regular lifestyle which of course can become quite overwhelming. Work life balance and healthy lifestyle have always been at the core of Helena’s interests. Not because she is good at it, but because she made all mistakes possible and has learnt from them. Former president at the French Lab, previously known as the French Junior Chamber, her main project was the launch of the Be Inspired Conferences meant to discover the real side of entrepreneurship. She now is building BARE, a project within the Beijing Global Shapers community meant for people to relate to each other by sharing the truth behind the curtain of so-called success. Helena is passionate about creating a space for people to inspire each other by having them share their personal stories and what they’ve learnt from their challenges. Global Wellness Day 2018 Speaker Godje is a trained psychologist and coach with a former career in the financial industry. Her viewpoint is that life is full of opportunities, ready to be realized in order to grasp your full inner potential. Godjes strength is to support you finding your dedication and passion and taking the right decisions in order to follow your own way of life. During her coaching sessions, Godje uses her skills she acquired during her work and life in the US, Europe, India and China and her personal leadership experience in international companies. Her aim is to support you to move forward and find happiness in your work as much as your life. Global Wellness Day 2018 Speaker Valeria is a Chakradance facilitator and a reiki practitioner. She is passionate about expressive arts, mind-body work and humanistic and existential psychology. Global Wellness Day 2018 Speaker Caesar has conducted experiential and character playing courses for individuals and groups. He has completed the Keith Johnston's improvisiation training programme, the Chicago Improv-Olympic as well as the Second City improvisation. He has conducted workshops in many parts of China covering performance, organizational development and team building. Global Wellness Day 2018 Speaker Wang Lei has more than 10 years of experience in Song Bowl. Global Wellness Day 2018 Speaker Johanna is a German-born Chinese who has been working as Producer Manger in Beijing for 5 years. With an ever changing life in China, she noticed early that it is both important to be flexible but also to create some routines in her life to progress and have some stability. Explore different ways to get clear about which new habits you could form and how to stick to these new habits. Also, explore habits you would want to get rid of. Global Wellness Day 2018 Speaker Have you been struggling with your inner voice: “I am not good enough? ” and allow that voice stops yourself from standing up and speaking up? Have you been criticizing yourself for not doing a good job, and try to avoid any occasion to speak in public? Join Joyce to find out the root cause on confident speaking, prepare our inner self to manage our fear and anxiety, learn and practice how to speak from our heart , and pick up tips to present ourselves confidently. Joyce is a freelance trainer and speech coach, with her 10 years IBM working and training experience ,and 8 years’ toastmasters public speaking practice. She is passionate to share her practice and develop people to communicate and present authentically. Global Wellness Day 2018 Speaker Ruth Novales received her training from the Institute for Integrative Nutrition (located in New York), where she studied a variety of dietary theories—Ayurveda, gluten-free, Paleo, raw, vegan, macrobiotics, and most everything in between—practical lifestyle management techniques, and innovative coaching methods. She believes that health is not confined to just diet and exercise. Rather, health encompasses the totality of truly living. Drawing on her expertise, she works with clients to help make lifestyle changes and choose health-promoting ways that produce real and lasting results. With her guidance, you will develop a deeper understanding of food and lifestyle that work best for you, improving your energy, balance, health, and happiness. By providing resources, motivation, and accountability, you will move toward your ideal vision of health within your unique body, lifestyle, preferences, and resources. Global Wellness Day 2018 Speaker Ping Ping loves to empower people along their journey to help them achieve their goals. She believes that everyone has the ability to make positive changes, discover new perspectives and insights to help them reach their potential. Global Wellness Day 2018 Speaker Yina, Senior Manager in an international automotive company, with rich HR experiences in different business in China and Southeast Asia. Being a Chartered Professional HR member Canada connects Yina with other HR profession worldwide. Join the coaching journey with Yina and explore your potential and gain learning through transformation coaching. Global Wellness Day 2018 Founder Frank lived in California for 10 years before moving back to Beijing, where the pace is fast, air is polluted, and healthy food options were expensive and untrusted. 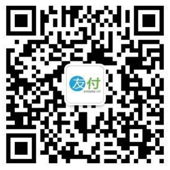 WellandFit is founded to help more people living in China live well and stay fit, offering natural, nutritious and high quality food products. We believe in a green, balanced and sustainable lifestyle. After the overwhelming response we had in 2017, with the positive impact made in people's lives in areas of physical, spiritual and social well-being, we cannot wait to do this again! 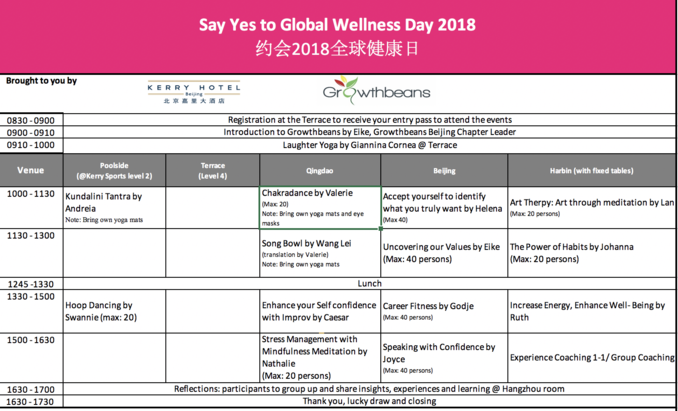 In 2018, Growthbeans and Kerry Hotel continue to bring you a day of wellness for the mind, body and soul. Trained by Schouten University China/The Coaches Training Institute, coaching combines Eike's passion: interaction with people, exploring new worlds, adventures and personal development. Alongside coaching, she likes to take people on bike tours through the Hutongs discovering Beijing with Wan Lin Bicycle Tours. She also runs the Growthbeans Beijing Chapter. Kundalini Tantra Yoga is not just any Yoga that helps you gain a new relationship with your body. It is the first program in Beijing that honors and heals the feminine energy within every women, using a blend of Tantra breath work, Kundalini Tantra Yoga, Taoist and shamanic practices, drumming and sacred intuitive movement to ignite the powerful woman within. It is a women body shame healing programme that allows you to move freely and express your soul in a profound way, honouring your essence from the core. ​Join Andreia to gain a new sense of confidence, strength, sensuality, trust and receptivity to understand what it means to be a woman in this world! Chakradance is a great healing modality based on the chakra system. We combine guided imagery, alternative music, spontaneous movements for participants to dive into their deeper self while the facilitator holds the space for you both energetically and physically. In this session, we’ll be dancing with eye masks on to fully let go and explore our deeper self. It’ll be a whole new experience for you. 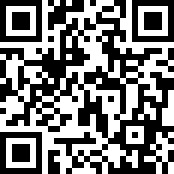 Valeria is super excited to see you join us on this wonderful journey and enjoy this unique, free expression of who you are! Helena is passionate about creating a space for people to inspire each other by having them share their personal stories and what they’ve learnt from their challenges. We live in a world where it is easy to compare ourselves to others. This creates a lot of pressure to always achieve more, which often leads to constant frustration, stress, sometime anxiety if not depression. We are having a hard time reminding ourselves what we want our priorities to be. “Is this matter that creates so much pressure that relevant?” “Isn’t that other thing more important for me to be at peace, feeling calm and happy?” Priorities are hard to identify when we don’t take the time to pause and reflect on what is triggering the most joy. We are often worried about the unknown and don’t take the time to truly project ourselves and get more familiar with the outcomes. Once we do, we realize first that what worries us isn’t that big of a deal and second, that what makes us content is achievable. How can we pause, sit with ourselves, with our fears and observe what is creating anxiety? Where is this fear coming from? How real is it? Once we accept who we are, our fears, the reasons why we are afraid, we can make a decision and move forward. Learn how to accept yourself, be comfortable with who you are. Let’s get on this journey together and be free to make our own choices. Art Therapy: Art Through Meditation is not a drawing class. Lan prefers to call it art therapy. Welcome and join her to draw together. In the process, know more about yourself and the things around you. What is 'love', 'Goodness', and 'Beauty'? What is the feeling of loving someone? With one word in mind and a loved one in your heart, In each line, express it. Pick up the pen, draw it. For each line holds- No comments, no comparison, just joy. Feel it with the heart, The song between pen, paper and hand. Follow it, Let it delight you with peace. Song bowl, also known as the Himalayan bowl, is a sound healing tool to release blockages within us and enhance our wellbeing. It resonates with each cell in our body and rebalances our emotional energy to the normal state of harmony. When the energy in the body can flow in harmony, our ability to self-heal is awakened. Come friends let our body of water molecules be at one with the sound of the Song bowl. As the name suggests, find out what your values are with Eike! In the Power of Habits, explore different ways to get clear about which new habits you could form and how to stick to these new habits. Also, explore habits you would want to get rid of. Johanna is a German-born Chinese who has been working as Producer Manger in Beijing for 5 years. With an ever changing life in China, she noticed early that it is both important to be flexible but also to create some routines in her life to progress and have some stability. Explore different ways to get clear about which new habits you could form and how to stick to these new habits. Also, explore habits you would want to get rid of. Founder Frank lived in California for 10 years before moving back to Beijing, where the pace is fast, air is polluted, and healthy food options were expensive and untrusted. WellandFit is founded to help more people living in China live well and stay fit, offering natural, nutritious and high quality food products. We believe in a green, balanced and sustainable lifestyle. Caesar brings to you 'Build your confidence with Improv'. From moment to moment, apply improv to your personal growth and enhance your leadership skills. Much often we are living in the first circle and third circle , how to find the second circle at the presence? how can you make he others feel comfortable when being with you? how you show your empathy in the leadership? Do you really “listen” to others when you are listening. Zeng Cheng, a theatre director, executive coach, team facilitator, applied improv practitioner, will be there with you for deep exploring with you for the meaning, skills , and values of applied improvisation. It is from the theatre and beyond the theatre. In Career Fitness, ​"Find what makes your heart sing and create your own music." Are you truly happy with your job? Have you found your spot? Is your career healthy for your life? Do you know what makes your heart sing? The facilitator of this workshop & Career Coach Godje Deuchert invites you on a journey to identify your true passion in order to create a career which not only includes success but also long-term happiness and wellbeing. During the session you will be given an overview of different techniques and learn more about how to apply them to your own life. Hoop Dancing is a flow art. Through Hoop Dancing, Swannie hopes to bring people inspiration to express their true self. The Hoop Heroines started one year ago when Swannie and Judith gathered around their passion: hoop dancing. From then on, they started training together and realized hoop dancing was completely unknown in Beijing. As a result, they are now launching workshops and classes to share and introduce people to this new discipline. Each of them also bring 10 years of experience in either modern-jazz and classical to give a multi-faceted approach. Join Swannie in Hoop Dancing! Is low energy holding you back from living fully? Would you like to increase your sense of well-being to feel vibrant and truly alive? Then, this session is for you! You'll find out what robs you of the valuable resource that is your energy and learn some practical - and surprising! - tips and strategies on how to renew, recharge, and increase your energy as well as improve your health and well-being NATURALLY. Join Ruth to increase energy and enhance your well-being! Godje is a trained psychologist and coach with a former career in the financial industry. Her viewpoint is that life is full of opportunities, ready to be realized in order to grasp your full inner potential. Godjes strength is to support you finding your dedication and passion and taking the right decisions in order to follow your own way of life. During her coaching sessions, Godje uses her skills she acquired during her work and life in the US, Europe, India and China and her personal leadership experience in international companies. Her aim is to support you to move forward and find happiness in your work as much as your life. Caesar has conducted experiential and character playing courses for individuals and groups. He has completed the Keith Johnston's improvisiation training programme, the Chicago Improv-Olympic as well as the Second City improvisation. He has conducted workshops in many parts of China covering performance, organizational development and team building. Ruth Novales received her training from the Institute for Integrative Nutrition (located in New York), where she studied a variety of dietary theories—Ayurveda, gluten-free, Paleo, raw, vegan, macrobiotics, and most everything in between—practical lifestyle management techniques, and innovative coaching methods. She believes that health is not confined to just diet and exercise. Rather, health encompasses the totality of truly living. Drawing on her expertise, she works with clients to help make lifestyle changes and choose health-promoting ways that produce real and lasting results. With her guidance, you will develop a deeper understanding of food and lifestyle that work best for you, improving your energy, balance, health, and happiness. By providing resources, motivation, and accountability, you will move toward your ideal vision of health within your unique body, lifestyle, preferences, and resources. Join Nathalie in Stress Management with Mindfulness Meditation! Sophrology means “the science of the consciousness in harmony”. Created in Spain in 1960 by a neuro-psychiatrist, it is a life-balancing technique aiming at an alert mind in a relaxed body. At the crossroads between Western relaxation and Eastern meditation, it is simple and does not require complicated postures. It has been used intensively in France, Switzerland, Belgium, Spain for more than 55 years in hospitals, schools, companies, sports coaching. Sophrology uses a very practical set of tools: relaxation, breathing, visualization and simple movements. It can help with: stress, anxiety, self-confidence, preparing for exams, speaking in public or interviews, pre and post-natal, sports mental preparation, insomnia, burnout, chronic fatigue, pain, depression. Nathalie is delighted to share it with you during this “Learn, Share and Grow together Day”. Standing in front of an audience can be difficult. With all eyes on us, the pressure is high and we may suddenly feel insecure. No matter what we feel on the inside, the good thing is that how we present ourselves on the outside can make a difference. Join Joyce to prepare our inner self to manage our fear and mentality and pick up tips to present ourselves authentically Are you facing a personal challenge, finding it difficult to achieve something, trying to make sense of things in your life now? Perhaps coaching is what you are looking for! Coaching is a partnership between you and a coach in a creative and thought provoking process to uncover your blindspots, gain self awareness and to unleash your personal and professional potential. In this session, come with something you might like to work on and have a taster of what coaching is all about. Coaching may be done on a 1 to 1 level or in small groups. Come and experience coaching with experienced coaches who can unlock deep insights to help you move forward in life! Nathalie has lived on five continents over the last 23 years and in more than 13 countries. The incredible journey and constant change led her to ask herself many questions about the meaning of life: How to be in harmony with ourselves when we lose our bearings? How to cope with this feeling of being uprooted? How to face this feeling of physical and mind dispersion? Searching for answers outside of herself, she finally realized that everything she needed was there, deeply anchored inside her. Certified in coaching from the University of New York and later in Mindfulness/Sophrology from the Franco-Swiss Academy of Sophrology, she wants to share her experience and help others. Have you been struggling with your inner voice: “I am not good enough? ” and allow that voice stops yourself from standing up and speaking up? Have you been criticizing yourself for not doing a good job, and try to avoid any occasion to speak in public? Join Joyce to find out the root cause on confident speaking, prepare our inner self to manage our fear and anxiety, learn and practice how to speak from our heart , and pick up tips to present ourselves confidently. Joyce is a freelance trainer and speech coach, with her 10 years IBM working and training experience ,and 8 years’ toastmasters public speaking practice. She is passionate to share her practice and develop people to communicate and present authentically. Ping Ping loves to empower people along their journey to help them achieve their goals. She believes that everyone has the ability to make positive changes, discover new perspectives and insights to help them reach their potential. Yina, Senior Manager in an international automotive company, with rich HR experiences in different business in China and Southeast Asia. Being a Chartered Professional HR member Canada connects Yina with other HR profession worldwide. Join the coaching journey with Yina and explore your potential and gain learning through transformation coaching.